The Oxford NAGS: English ceilidh and barn band from Oxfordshire. Stomping English tunes for stomping English dances. Oxford NAGS is a four piece ceilidh band based around Oxfordshire and a bit of Hampshire. They play stonking English tunes for stonking English dance. Nina Hansell (PolkaWorks, The Bismarcks) has been playing the fiddle and English traditional music for more than 30 years and is deeply committed to traditional dance, through morris, clog and providing music for other dancers. She delights audiences with her passion for playing bouncy English tunes – not only do the audience feel the need to dance, she does too; in fact she can't not. Sandy Shallis is a melodeon player from Adderbury. She plays for folk and local ceilidh bands including Tinker's Ditch, and her local ladies morris side. 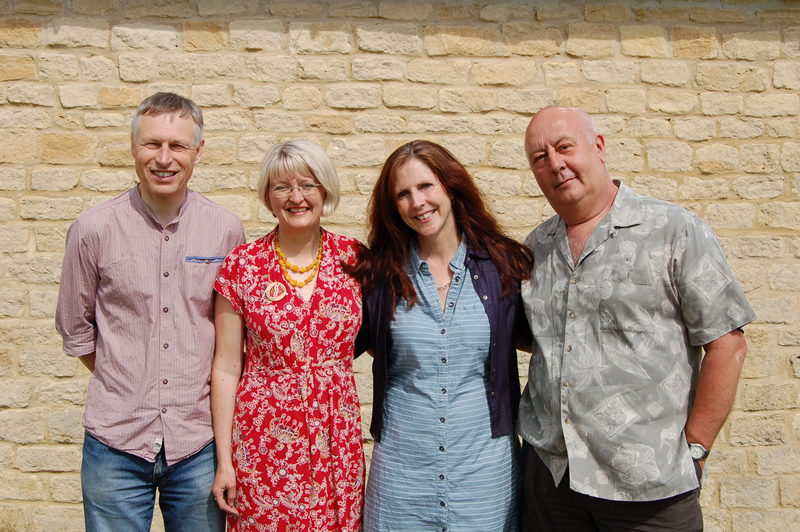 She recently teamed up with Tim Howes and won Best Folk Duo at the Chipping Norton Music Festival. John Kirkpatrick described their performance as outstanding. Sandy keeps her melodeon-arm muscles in shape by pulling pints in The Bell, Adderbury, which she manages with courtesy and aplomb. Andy Turner plays anglo-concertina with Oxfordshire dance band Geckoes, and with the concert band Magpie Lane. He is a very experienced dance musician, having been playing for ceilidhs, barn dances and morris for over 35 years. Andy gets tunes out of an Anglo concertina that aren't there. He is a lot older than he looks. Gareth Kiddier (many, many bands, including PolkaWorks, The Bismarcks, English Contra Dance Band and The Watch) sits in the corner and plays the piano, and generally does what he's told. Meltdown Ceilidhs, Haywards Heath, 19th March 2017. Truro Folk Dance Club, Haddon Village Hall, 2nd December 2016. For all enquiries please contact Gareth Kiddier on gareth.kiddier[at]gmail.com replacing [at] with @. Copyright © The Oxford NAGS. All rights reserved.